Anthem Authors maintains a display case in the main recreation center in Sun City Anthem, Henderson, Nevada, where I reside. Currently Eagle Talons, The Iron Horse Chronicles–Book One, is the featured presentation. That honor was bestowed upon me by my fellow members of Anthem Authors because of the October 2014 publication date of the first book in my trilogy. [media-credit name=”Mary Ann Unger” align=”alignleft” width=”300″] [/media-credit]Mary Ann Unger, president of Anthem Authors, decorated this copy of Eagle Talons with an Indian necklace bearing eagle talons. She also included her husband’s HO scale model of UP 119. My June 9, 2014, blog post contains a photo and information about this famous Union Pacific locomotive that participated in the Golden Spike ceremony. Sharp eyes will detect that UP 119 is the locomotive depicted in the header of this website. 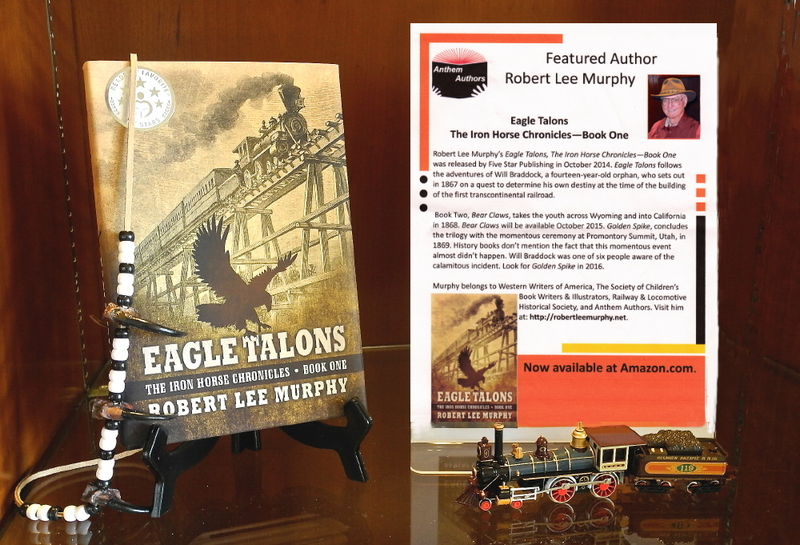 “Robert Lee Murphy’s Eagle Talons, The Iron Horse Chronicles—Book One was released by Five Star Publishing in October 2014. Eagle Talons follows the adventures of Will Braddock, a fourteen-year-old orphan, who sets out in 1867 on a quest to determine his own destiny at the time of the building of the first transcontinental railroad. Book Two, Bear Claws, takes the youth across Wyoming and into California in 1868. Bear Claws will be available October 2015. Golden Spike, concludes the trilogy with the momentous ceremony at Promontory Summit, Utah, in 1869. History books don’t mention the fact that this momentous event almost didn’t happen. Will Braddock was one of six people aware of the calamitous incident. Look for Golden Spike in 2016. This entry was posted in Bear Claws - Book Two, Eagle Talons - Book One, Golden Spike - Book Three, The Iron Horse Chronicles, Transcontinental Railroad, Union Pacific and tagged Adventure Fiction, Bear Claws, Eagle Talons, Fictional Character, First Transcontinental Railroad, Five Star Publishing, Frontier Fiction, Golden Spike, Historical Fiction, Historical Parks, Model Railroads, Pioneer Life, SCBWI, Teen Fiction, The Iron Horse Chronicles, Transcontinental Railroad Locomotives, Western Fiction, Western Writers of America, Will Braddock, Writers' Associations, Young Adult Fiction, Young Readers. Bookmark the permalink. Very impressive! Such a nice display of an exciting, well written book and it’s author! !